The Associated Press The Steelers’ Ryan Shazier and defensive coordinator Keith Butler talk during a practice Wednesday. PITTSBURGH — Ryan Shazier’s routine hasn’t changed much, even after a life-altering spinal injury put his football career in jeopardy. Shazier walked into the media room with help of a cane and spent 20 minutes outlining his journey since he lowered his head to hit Bengals wide receiver Josh Malone in the first quarter on Dec. 4. He called the moment after impact when he grabbed the small of his back while his legs lay motionless “a little scary,” but was quick to thank emergency responders in Cincinnati for their delicate work on the field in the immediate aftermath. He underwent spine stabilization surgery on Dec. 6 and has spent the intervening months remaining adamant he would play again while being a fixture at the team’s practice facility, where he has become a de facto coach. It’s a role he’s embracing, but one he’s not quite ready to accept on a full-time basis. 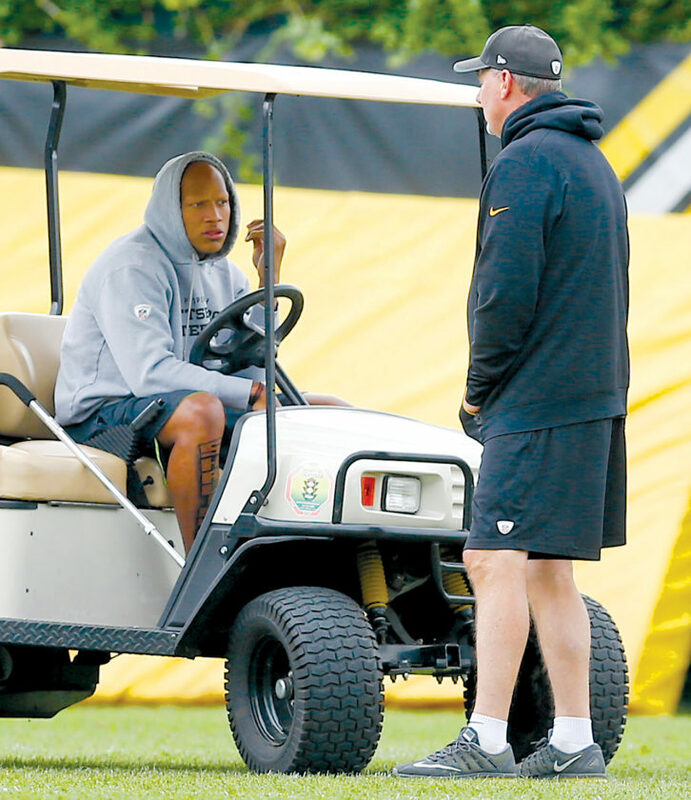 “Just because I got hurt doesn’t mean I’m going to stop loving the game of football,” said Shazier, who added that despite the injury he’s going to give it “everything I have” in an effort to return to play. Details of the exact nature of Shazier’s injury and his long-term prognosis remain sparse. He declined to get into specifics about whether playing again is even medically feasible, saying his medical team has told him to focus on making incremental improvements. Shazier has made remarkable progress in the last six months. He spent several weeks in the hospital following surgery, though he took time out to attend several Steelers home games near the end of the 2017 season. He regularly posts updates through his social media accounts and provided an indelible moment during the NFL draft in April when he walked on stage in Dallas to announce Pittsburgh’s first-round selection. He’s received a massive outpouring of support from all over, including an avalanche of “Get Well” letters from over 500 students at an elementary school. “I’ve met a lot of interesting people, a lot of people I never thought I’d meet,” Shazier said. The 25-year-old two-time Pro Bowler believes walking without assistance is the next milestone, one he refuses to put a timetable on. He is trying instead to focus on his health, how to best help the Steelers even if he can’t join them in the huddle, while making sure to appreciate it that he’s made it even this far. He understands some do not. There is no guarantee Shazier will be able to run again without assistance, let alone throw on a pair of shoulder pads. It’s something he’ll live with if he has to. Yet he owes it to himself to try.